Update from the Field: What's happening with the ECONet? Figure 1. Current outline of an ECONet TowerEver wonder where the data comes from which TV Meteorologists use to base their 3 to 7 day outlook? Or the different types of data being used to create some of the fine products you see on our website? The answer is simple. All weather models are generated by climatological data obtained from on site weather stations located all around the country. There are numerous networks, sponsored by various agencies, that all measure similar parameters in order to better serve the needs of their clientele. Our in-house network of 38 weather stations, the North Carolina Environment and Climate Observing Network (or ECONet), is no different. The ECONet helps serve the needs of our partners at the Forest Services, Agricultural Research Stations, and the fine people of North Carolina. We measure parameters similar to those weather stations used by the National Weather Service like air temperature, station pressure, wind speed, wind direction, relative humidity and precipitation. These parameters are all measured at 2 meters (approximately 6.6 feet) above the surface with the exception of precipitation, which is measured at 1 meter, or 3.3 feet. Wind speed and direction are also measured at 10 meters (approximately 33 feet) according to standards set by the World Meterological Organization. To better serve our agricultural partners, we install two types of radiation sensors at 2 meters above the surface: one that measures total incoming solar radiation and the other measures photosynthetically active radiation (or PAR). PAR is important to crop growers as it helps determine the amount of sunlight being used for plant growth. Agricultural researchers also want to know about soil parameters, such as moisture and temperature, which the State Climate Office (SCO) also deploys at each of their sites. The ECONet previously only measured these parameters at one depth (20 cm below the surface for soil moisture and 10 cm below the surface for soil temperature). 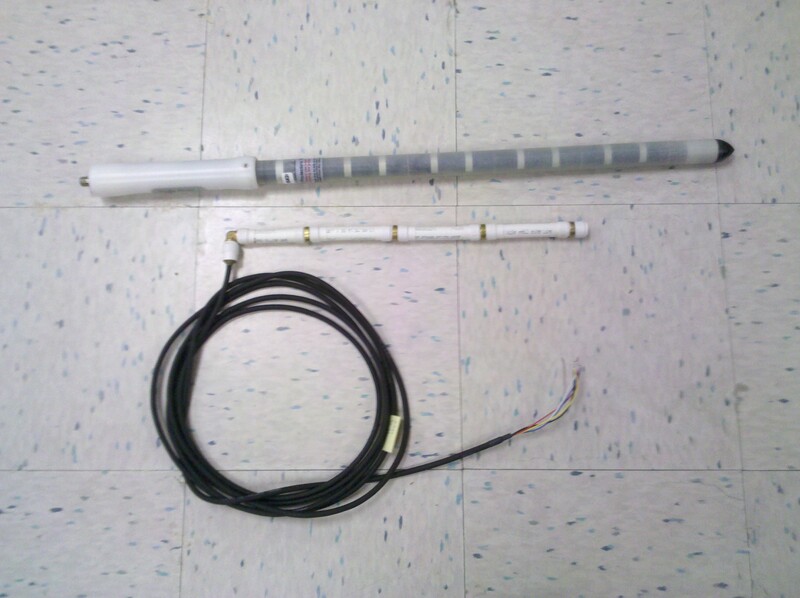 However, starting in the summer of 2012, the SCO began deploying multi-level soil moisture and temperature probes (Figure 2) to better understand how moisture navigates through different types of soils. Currently, 12 of our stations have these new sensors, which measure soil moisture and temperature at 10, 20, 30 and 40 cm, with the hope that the rest of the network receives the new sensors shortly. We've also added a leaf wetness sensor (Figure 3) at just under 1 meter high to help farmers with not only watering crops but with disease movement. To better understand how the leaf wetness sensor defines when a leaf is "wet", we are currently examining the ability to categorize "wet" conditions by comparing the sensor values to relative humidity, precipitation, and dew point depression (or temperature minus dew point). Figure 3. Leaf Wetness sensor. 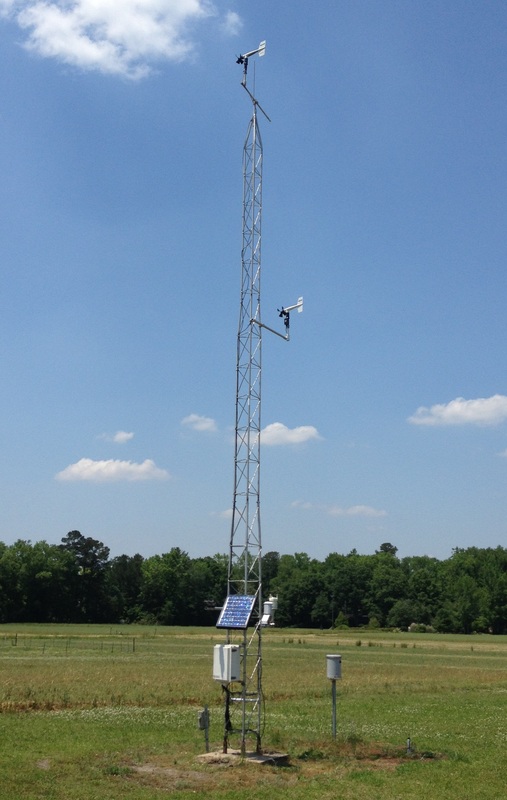 Finally, the newest additions to the suite of sensors used at the ECONet, a wind sensor at 6 meters, benefit our partners at the Forest Service. As they look for data to better help them protect us from forest fires, they enlisted the ECONet to deploy wind sensors at 6 meters (approximately 19.7 ft.) on all of our stations, as seen in Figure 1 about halfway up the tower. Currently, 34 of 38 stations have these sensors with the remaining stations to receive them by the end of the year. 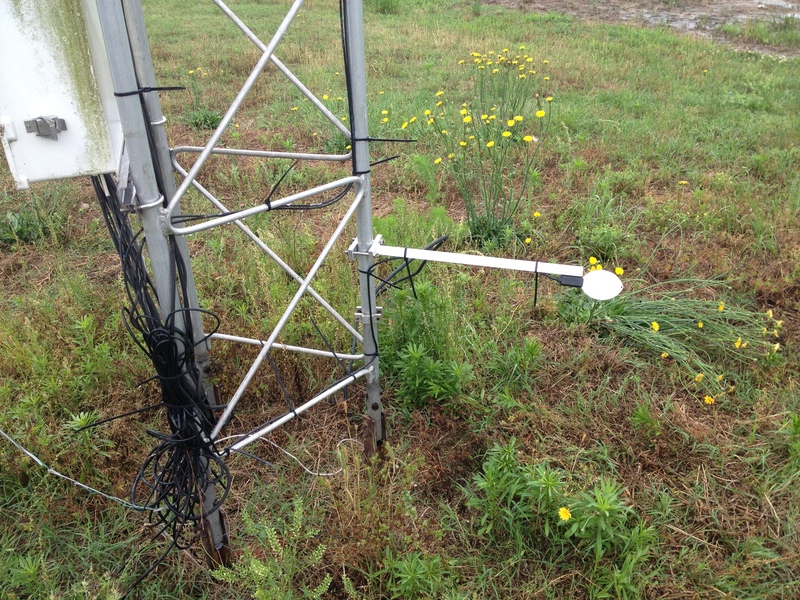 These sensors are identical to the ones used at 10 meters and are at the height similar to the ones used by the Forest Service sponsored Remote Automated Weather Network (RAWS). The vast majority of ECONet data is available on our website . We are always testing new instruments to see what sensors give the most accurate data to help everyone enjoy the weather in this state just a little more! So go ahead and take a look at the vast amount of weather data that the State Climate Office of North Carolina collects and maintains to better serve the people of North Carolina!! Halfway through summer... What summer?